Thank you for choosing Ginger - we truly appreciate that! Before you start setting up your website, please read through this documentation. 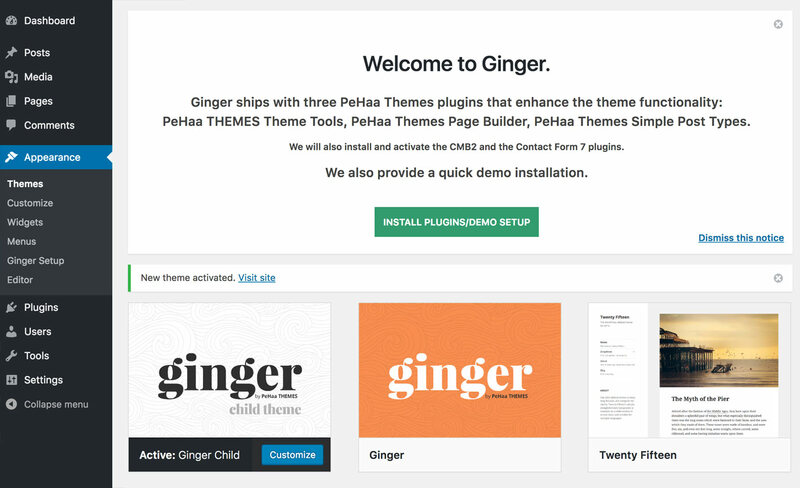 Ginger theme does not support WordPress version earlier than 4.0 so make sure you've got the current version of WordPress. In order to download the current version, please visit wordpress.org. Please check WordPress Codex for information on how to install WordPress on your server. Once WordPress is successfully installed, you will have to upload the theme to your WordPress directory. We highly recommend activating the Ginger's child theme instead of Ginger itself. That means you will have to install two themes: ginger and ginger-child. Download and unzip the ginger-package folder. You'll find two zipped theme folders ginger.zip and ginger-child.zip. Open your WordPress dashboard. Go to Appearance > Themes. 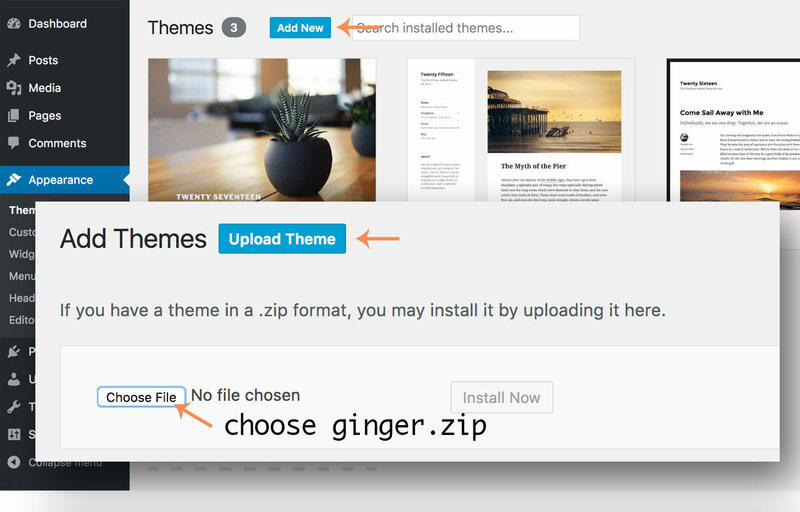 Click the Add New Theme button, then Upload Theme and select the ginger.zip file. Click Install Now. Don’t activate the theme yet. Repeat the upload/install process for with the ginger-child.zip file and activate the ginger-child theme once installed. If you encounter problems during the installation process, make sure to check Common WP Installation Issues. Once activated, Ginger will display a Welcome Screen sending you to the Ginger Setup page (you can also access it in Appearance > Ginger Setup). You can choose between installing and activating recommended plugins or installing, activating, configuring for the demo and importing the demo data. Please note that in this case no plugin configuration is done. All installed and activated plugins run with their default options. If you choose Install + Activate Plugins and Import the Demo Data the plugins listed above will be installed and activated. PeHaa Themes Page Builder will be activated on pages and projects. Note that none of these plugins is strictly necessary and if you don’t install them or deactivate any of them Ginger will still be fully functional. First of all PeHaa THEMES Theme Tools enables the one-click installation of the demos. It also registers two additional custom widgets, Ginger About Widget and Ginger Recent Posts with Thumbnails. that displays the links to the next and previous post/custom post type. By default, after the plugin activation, it's activated on Pages. If you want to use it for posts or custom post types added with PHT Simple Post Types go to the PHT Page Builder menu page and check the post types you want to use the page builder for. PeHaa Themes Simple Post Types is a simple plugin by PeHaa Themes that allows you add easily custom post types and custom taxonomies. So if posts and pages are not enough and you need projects, recipes, team members or kittens then PHT Simple Post Types is a way to go. You will need this plugin (available in WordPress repository) to manage some additional settings for your posts and custom post types. See the Post/Page Metaboxes section. One of the popular plugins that manages (multiple) contact forms. It's optional, please feel free to use a contact form of your choice. 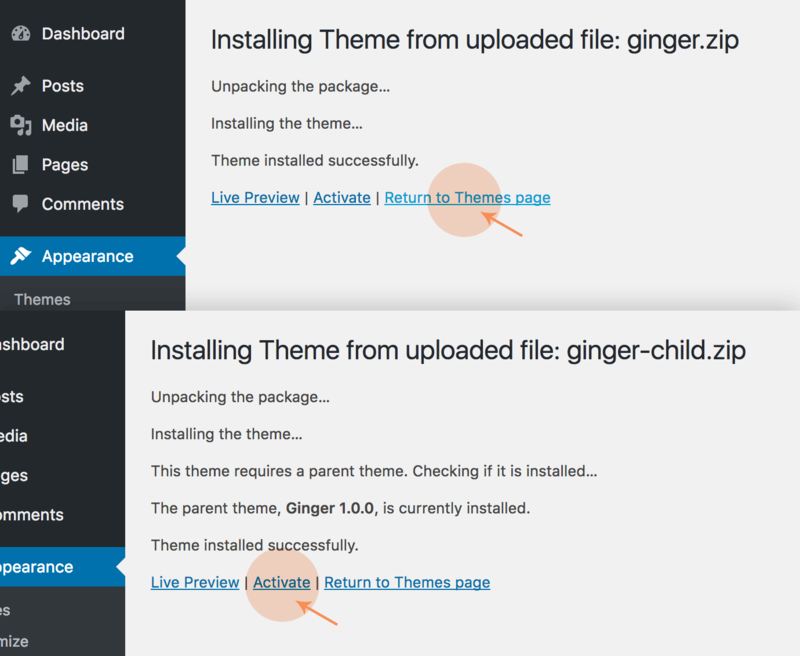 Unless you are absolutely sure that you will never ever need to modify any of the theme files you should install and activate a child theme for Ginger. For your convenience Ginger comes with a ready to use child theme. 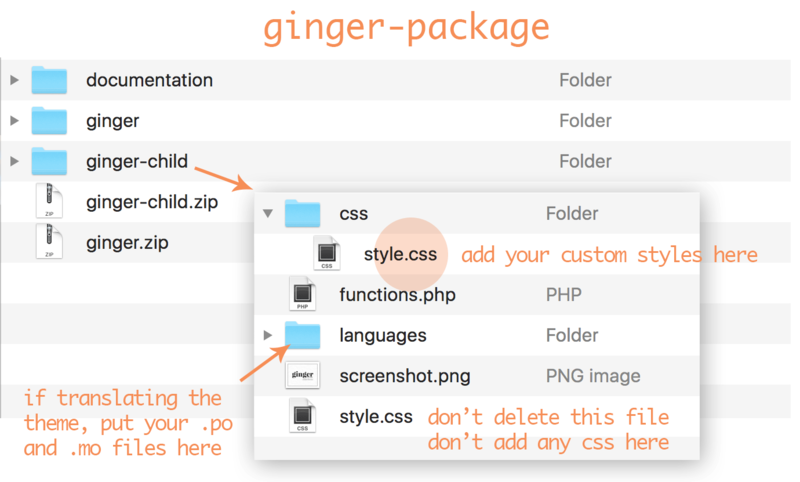 You’ll find the “ginger-child” folder in the theme package folder as well as a install-ready ginger-child.zip file. Its files structure is as in the image below. If you want to modify the theme css, you’ll have to edit the css/style.css file. It contains the three lines of code as below. Please note that you should not use “@import”, the parent css is loaded before your custom child css so “@import” is no needed. If you are translating your theme (see Translate Your Theme section) you should add your translation files into the languages folder in your child-theme. 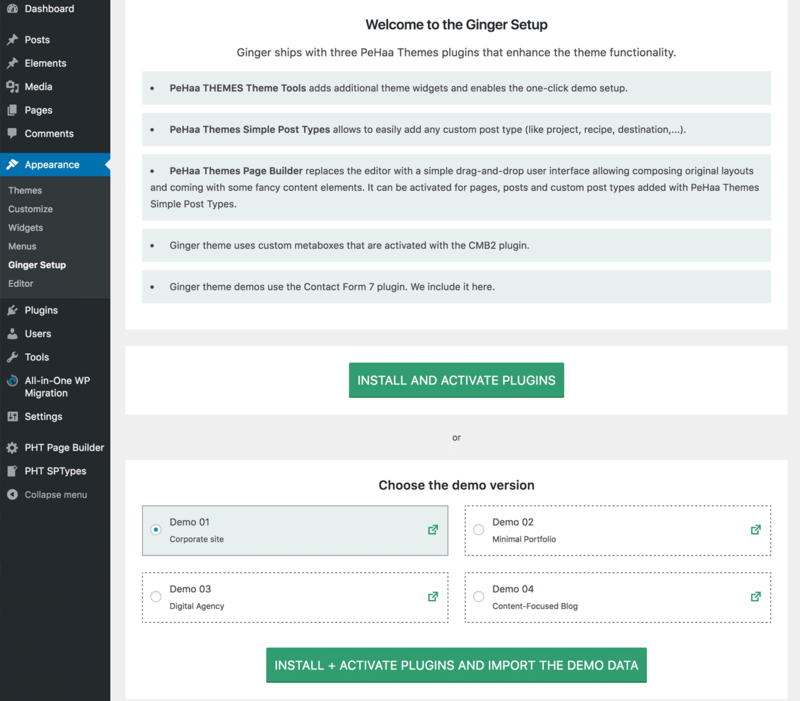 With Ginger setting options happens through the WordPress customizer. That means the front-end view and your changes instantly visible – a big advantage from the user perspective. All your customization is theme specific and your settings will not be applied if you switch between a child and the parent theme. We didn't wanted to overload the Ginger theme with options. They are divided into 6 sub-panels. In this panel you can disable the transitions between pages. If disabled you'll get back the normal behavior when changing from one page to another. You can find more info about the page transitions in the Transitions section. In this panel you can also opt for simplified styling (we used it in Demo 02 - Minimal Portfolio). Here, You can choose between the site header bar position, either horizontal at the top or vertical (this applies to screens > 1023px). This setting also affects how and where the navigation menu is displayed: in the right sidebar (by default) or as a multicolumn menu in the top, vertical bar. You can also decide to rotate the logo or site title. 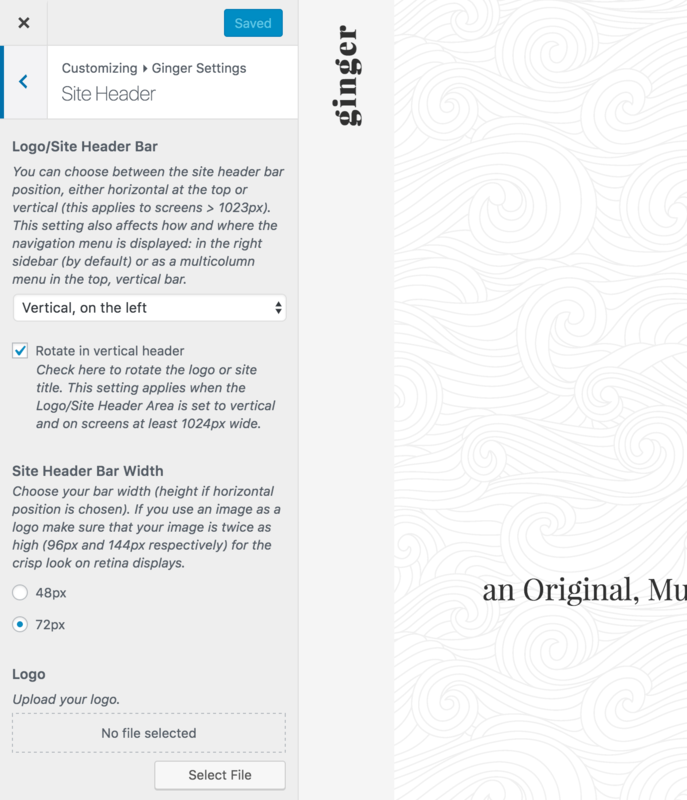 This setting applies when the Logo/Site Header Area is set to vertical and on screens at least 1024 px wide. There are two bar width (or height if in horizontal position) options available . If you use an image as a logo make sure that your image is twice as high (96px and 144px respectively) for the crisp look on retina displays. In this panel you can add your social links - the available ones are: Behance, Blogger, Dribbble, Facebook, Flickr, Google-plus, Instagram, Linkedin, Pinterest, Twitter, Vimeo, and Youtube. Some users like to personalize the logo displayed on the login page. You can upload a dashboard logo that will replace the default WordPress one. The displayed logo height is 84 pixels. For a crispy look on retina screens prepare your image double sized – the width should not exceed 640px and the height should be 168px. 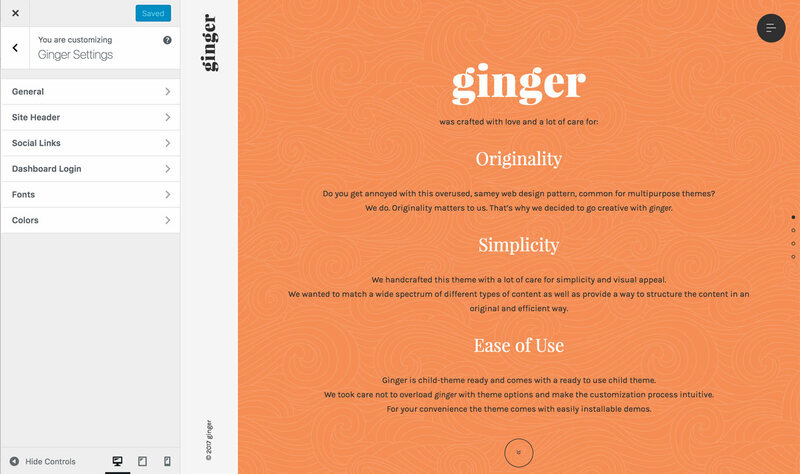 With Ginger you can use two custom font families: one for the body text and one for the headings. 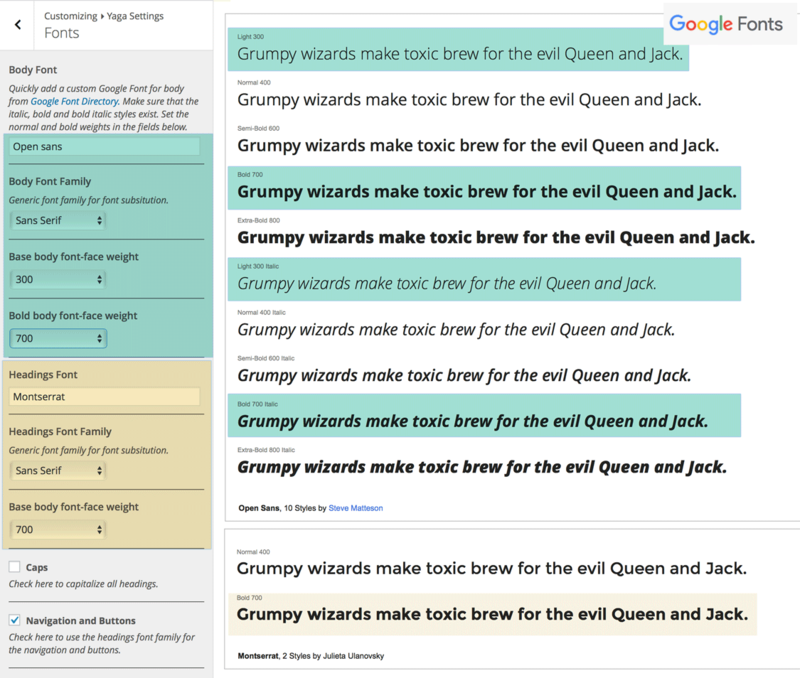 Simply choose a Google Font for body from Google Font Directory. You can also decide to capitalize all the headings. Once the CMB2 plugin is installed and activated all posts and custom post types display a custom metabox Ginger Custom Settings. For posts you can decide to skip author’s bio or share links. 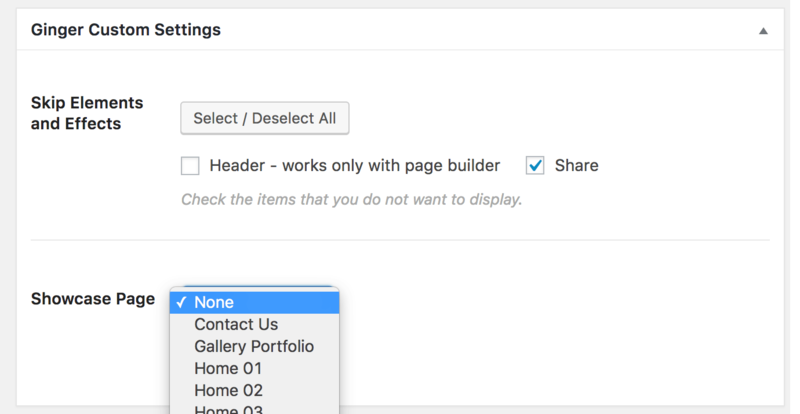 On custom post types you can also opt for skipping the automatically generated header pane (if page builder is activated) and the share links. 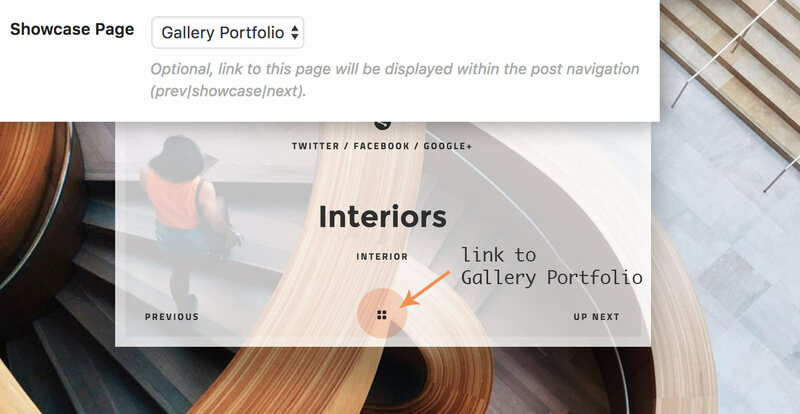 You can also set a link to the "showcase page" that will be displayed as a part of the post navigation. Ginger is translation-ready. You’ll find the ginger.pot file in the /languages folder. You can use POEdit to translate your theme. Once downloaded and installed go to File > Open and choose the languages/ginger.pot file in your theme folder. Line by line translate the theme to your language. Go to File > Save as.. and save your files in the languages folder in your child-theme. Name your file accordingly to WordPress language codes, you may find them here. For example the language code for French is fr_FR so you would save your file as fr_FR.po. Note that the fr_FR.po file will be automatically compiled to fr_FR.mo file. Make sure that WordPress knows which language you want to use. From WordPress 4.0 you don't need to edit the wp-config.php file to do that. Go to your Dashboard > Settings > Site Language choose your language and Save Changes. Ginger theme makes use of the barba.js library to enhance user experience by adding fluid transitions between pages, reducing the delay between your pages and minimizing browser HTTP requests. This feature can be disabled in the Customization panel, see here. Please note that the transitions are disabled for logged-in users, if you want to check this setting, go to your Dashboard > Users > your Profile and check Enable Transitions in the General Ginger Settings section. If the video doesn’t display, you might have to add the following in your .htaccess file (concerns Linux/Apache servers). For more information see Mediaelementjs documentation. The images used on archive pages are automatically generated (resized) by WordPress during the image upload process. If your images are already uploaded please use the Regenerate Thumbnails plugin, that will generate the missing size for you. You don’t need this plugin if you start building your site with Ginger and you’ll upload all your images with Ginger being activated. In this case you should either turn off the css minification via your optimizationn service or enqueue the unminified css file. 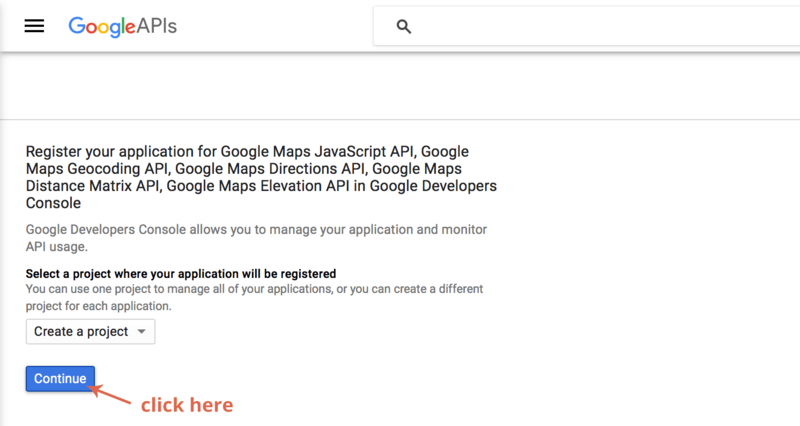 If you want to add a Google Maps you’ll have to create your Google Maps API key to display your google map. 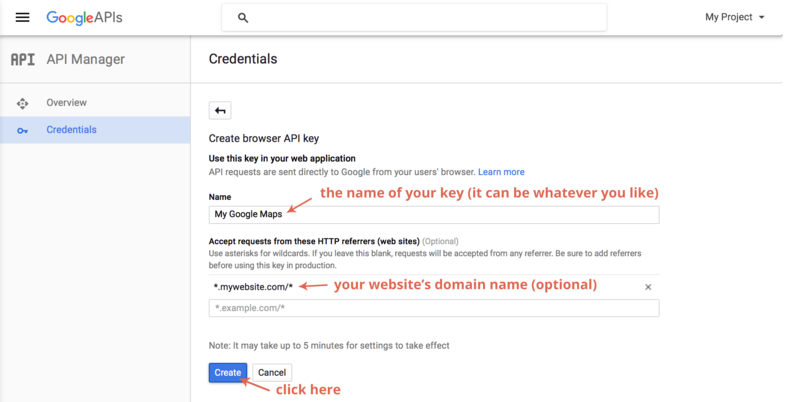 To obtain the API key you will have to login to the Google Developers Console (follow this link) (you’ll need to have/create a Google account). You’ll be guided through the process. All you need to provide is some key name (you can set whatever you like, for example My Google Maps) and (optionally) you can input your website’s domain name (add an * in front of it to allow access from both www.domain.com and domain.com). Copy your API key and paste into the field in the PHT Page Builder settings. Save Changes. Please note that it can take a few minutes for settings to take effect. Thank you. Please don't hesitate to contact us via our themeforest profile page. © PeHaa THEMES. This documentation template is provided by Frittt Templates.